Boss Rob Page is confident he can ‘put the wind back in the sails’ of his Cobblers players ahead of Saturday’s Sky Bet League One clash at Bristol Rovers. After a bad run before Christmas, the Town manager felt his team were building a little bit of momentum with their 1-0 Boxing Day win at Oxford United which was followed up by a spirited performance in losing 1-0 to a late, late goal at Sheffield United. At half-time in Monday’s clash with Bradford City at Sixfields that momentum was being maintained as they led the Bantams 1-0, but then things went awry. The Cobblers went on to turn in one of their poorest 45 minute performances of the season as they surrendered that 1-0 advantage to again concede late goals and lose 2-1, and leave the Sixfields supporters disgruntled and more than a bit pessimistic going into the the new year. Page would have been more than aware of how upset the fans were as he listened to the boos and jeers while standing in the techincal area, but he is staying positive. “It has been frustrating,” said the Town boss. “We had a great result at Oxford, we go to the league leaders Sheffied United, and for 88 minutes we are in the game before we lose it late on. “I felt we were building momentum and picking things back up again, and then we play Bradford who will be there or thereabouts this season and we get beat 2-1, and again it is because of what we have done. “It’s not that Bradford have had to work extremely hard to get the result, it was because of our decision making, and it seems to have knocked the wind out of our sails again. 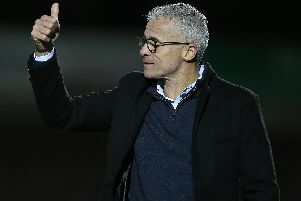 “It is now my job to put the wind back in those sails, and get us full of confidence going into the Bristol Rovers game. “Living in Sheffield, I had a lot of positive feedback from our performance from the supporters up there who felt we defended well and played well at times in that game. The Cobblers have the chance to bounce back from the setback against the Bantams when they travel to a Bristol Rovers side promoted with them from league two last season. Despite only winning one of their opening seven league one games, the Gas have enjoyed a good start to life at the higher level, and currently sit in 10th place having performed the best of the four sides that went up last May. They are six points better off than the Cobblers, and were 3-2 winners at Sixfields in October thanks to Charlie Colkett’s stoppage time strike. Colkett won’t be involved this weekend as he has been recalled from his loan by Premier League leaders Chelsea, but Darrell Clarke’s team are still in good shape. Despite the fact the Gas were hammered 4-1 at Charlton on Monday, they have won their past three home games in the league, and Page said: “I think Bristol Rovers have done okay, and have settled into the season. “They are coming into this game off the back of a heavy defeat, but I think he made six changes to his team for that game against Charlton from the previous game against Wimbledon. “So I don’t know what he is going to do with regards to his team, and can only focus on what we are going to do, and to take the game to them. The main attacking threat for Rovers is Matty Taylor, who has 18 goals to his name in all competitions this season, with 15 of those coming in the league. He was rested for the trip to the Valley, coming on for the final half-hour, but is sure to start against the Cobblers, although that doesn’t overly concern Page. “Matty Taylor is going to be a threat, but we have played against Sheffield United and in the main we have coped with their threat quite well,” sais the Town manager. “That was against, in my opinion, one of the best centre forwards in the division in Billy Sharp. “Of course Taylor is a threat, and we will be ready for it. The Cobblers are set to make changes to the starting line-up from the team that lost to Bradford, with loan pair Gregg Wylde and Hiram Boateng set to make their full debuts. Gaby Zakuani is unavailable due to international duty, while right-back Aaron Phillips is out with a hamstring injury.